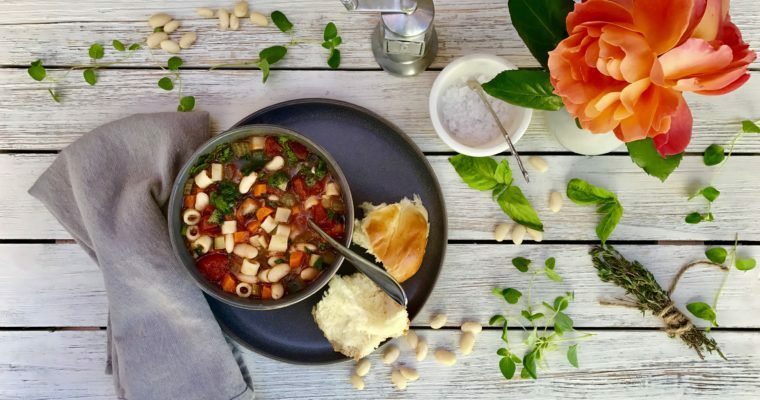 To me, hearty soups are good all year round, not just on a rainy winter day. Soups are comforting and soul-healing, they say. They are also not all that hard to make. 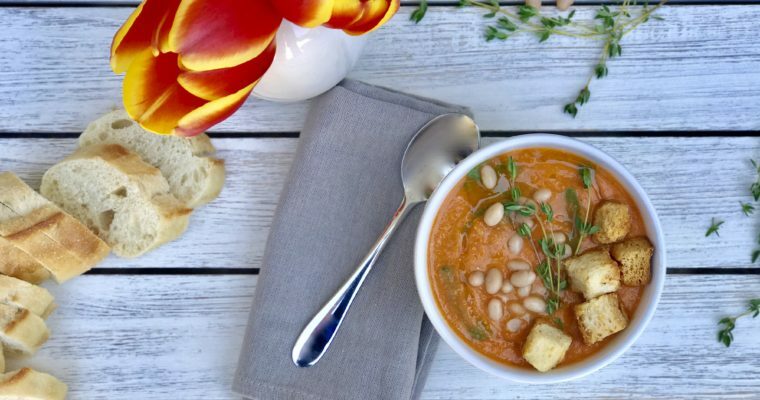 The word “soup” comes from French “soupe” (meaning “soup” or “broth”), which derived through the Latin word “suppa” (meaning bread soaked in broth) and also from a Germanic source, the word “sop”, which refers to a piece of bread typically used to soak up soup or a thick stew. This helps explain why soup is often served with bread: they do complement one another nicely. In the cooking world, soup is almost error-proof; it is adaptable and forgiving. Most soups also benefit from sitting, so making a soup the day before serving it actually is prefered for blending flavor and adding complexity. Any soup (or stew for that matter) can easily be thinned out slightly the following day with stock (or water); that’s what is done in professional kitchens. The secret is that the chef must always adjust the soup seasoning. This is what home cooks often forget. Readjusting the salt and pepper is a must, and sometimes other spices need refreshing as well. 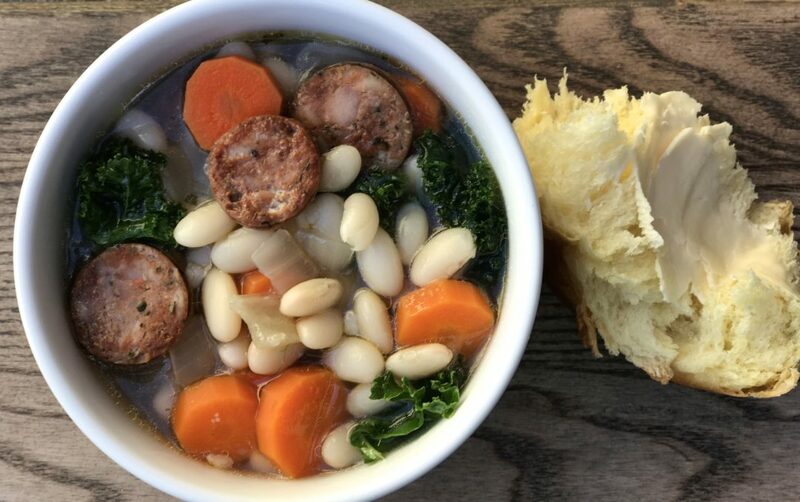 This recipe for White Bean Soup with Kale & Sausage is for a clean, clear broth soup that is also filling (and packed with protein) because of the addition of beans and sausage. So simply serve it with a nice green salad and your favorite bread. And to me, you have a pretty perfect meal. Step 1 In a large stockpot, place the beans and cover with water by 2 inches. Place over high heat and bring to a boil. Once boiling, remove from heat and let stand, uncovered, for about 1 hour. Drain beans, rinse and set aside. Step 2 Place a medium stock pot over low heat and add the olive oil. When hot, but not smoking, add the onions and carrots and sauté, stirring occasionally, until softened, about 5 minutes. Step 3 Add garlic and cook and additional 1 minute. Step 4 Add the beans, chicken broth, water, cheese rind, salt, pepper, bay leaf, thyme and rosemary. Simmer, uncovered, until beans are just tender, about 50 minutes. Step 5 While the soup is simmering, brown the sausage in batches in a heavy skillet over medium heat. Drain the sausage on a plate lined with paper towel and set aside. Step 6 Add the carrots to the soup and simmer for an additional 5 minutes. Step 7 Add the kale, browned sausage, and additional water (only if needed) simmer, uncovered, stirring occasionally, until the kale is tender, about 20 minutes. Step 8 Season soup to taste with salt and pepper.